Hungarian Prime Minister Viktor Orban said on Saturday that European parliament elections next year could bring about a shift toward illiberal “Christian democracy” in the European Union that would end the era of multiculturalism. The right-wing nationalist Orban, re-elected in April to a third consecutive term, has spearheaded eastern European resistance to EU moves to have member states accept asylum seekers and migrants under a quota system. Along with Poland’s nationalist government, he has been in constant conflict with the European Commission, the EU’s executive, over what Brussels calls an erosion of democratic institutions in formerly communist east European countries. US President Donald Trump meets with EU Commission President Jean-Claude Juncker amid concerns of a growing trade dispute between the two economies. In an annual speech to ethnic Hungarians in Baile Tusnad in neighbouring Romania, Orban portrayed the 2019 European parliamentary vote as decisive for the future of Europe. He said the Western political “elite” of the EU had failed to protect the bloc from Muslim immigration and it was time for them to go. “The European elite is visibly nervous,” Orban told hundreds of cheering supporters. 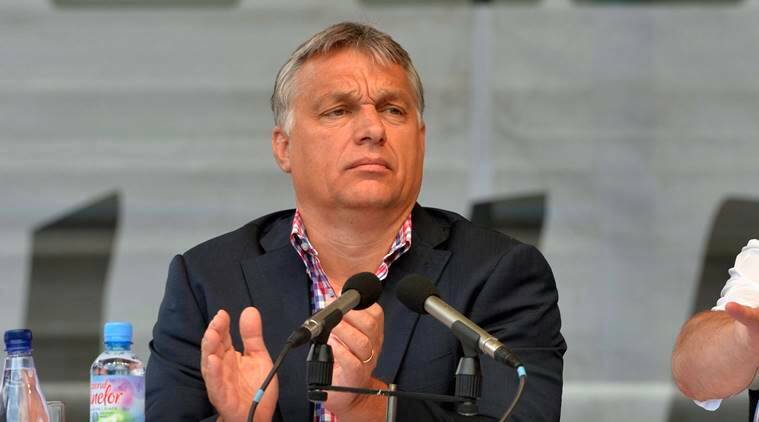 “Christian democracy is not liberal…It is illiberal, if you like,” Orban said. Unlike liberal democracy, he said, Christian democracy rejects multiculturalism and immigration while being anti-communist and standing for Christian values. On Friday, Orban welcomed the founding of the anti-EU Movement group by Steven Bannon, a far-right former aide to US President Donald Trump, to boost the nationalist, anti-immigrant vote for the European Parliament next year. Orban’s Fidesz party, which firmly leads opinion polls, has also demonised Hungarian-born US billionaire George Soros and the liberal charity groups he supports. Fidesz has pushed through legislation to restrict the activity of civil society groups that it accuses of encouraging illegal migration. Orban accuses Soros of promoting mass immigration to undermine Europe’s Christian culture. Soros denies this. Orban has also built warm relations with Russia, which is building a nuclear plant in Hungary, and repeatedly criticised EU sanctions against Russia imposed after its annexation of Ukraine’s Crimea region in 2014.